Have more babies to build the ranks of Singaporeans and get set for a construction boom but accept heavier congestion and more foreign workers as the crowded Asian city-state grows into a global centre with 30 percent more people. That is the vision for Singapore set out on Tuesday by the long-ruling government, just days after it lost a seat in parliament in a by-election defeat that reflected rising discontent over soaring costs and an influx of immigrants. The white paper on population, released after months of public consultation, seeks to address concern about affordable housing, good jobs and quality of life while trying to boost a chronically low birthrate as the workforce ages rapidly in the wealthy country of 5.3 million people. By 2030, the population could grow to between 6.5 million and 6.9 million, the government said in the paper, as it stressed the importance of keeping Singaporeans "the core of our society", supporting a dynamic economy and meeting infrastructure needs. "Many Asian cities are modernising rapidly, and catching up on us," it said. "Singapore must continue to develop and upgrade to remain a key node in the network of global cities, a vibrant place where jobs and opportunities are created." With a stern, technocratic approach, the People's Action Party (PAP) has built up Singapore from a post-colonial outpost into a major business hub during its five decades in power. Since suffering its worst election showing in history in 2011, the government has sought more input from citizens and has ramped up social spending, restricted lower-skilled foreign workers and taken steps to cool property prices. But Saturday's by-election defeat may be a harbinger of the public reaction to its latest plan for the economy and society. "I am very worried," said Gwee Choo Beng, 42, who works in the construction sector. "I don't see the advantage of an increasing population. We will suffer with rising costs and high property prices. I don't think the cooling effects work." Immigrants now make up nearly 40 percent of the population, up from about 25 percent in 2000, fuelling concern about the cost of living, overcrowding and threats from cheaper labour on an island with less than half the area of London. "There is an element of risk to bringing in more foreigners," said P.N. Balji, a former newspaper editor who now works as a media consultant. "The angst is still there. It depends on how the government can ease the challenges. Singapore's trade-driven economy has been in the doldrums since last year, hurt by slowing demand for electronics that has been exacerbated by the strong Singapore dollar and measures making it harder for companies to hire low-wage foreign workers. Up to 2020, the white paper said, the economy will expand at an average rate of 3-5 percent if productivity can be raised by 2-3 percent each year and overall workforce growth stays at 1-2 percent. But economic growth is more likely to average 3-4 percent over the whole period, it said. "If we do too little to address the demographic challenge, we risk becoming a steadily greying society, losing vitality and verve, with our young people leaving for opportunities elsewhere," the government said. "But if we take in too many immigrants and foreign workers, we will weaken our national identity and sense of belonging, and feel crowded out of our own home." The growth in population will involve persuading citizens to raise their fertility rate from 1.2 babies per woman to closer to the replacement level of 2.1, while handing out citizenship to more foreign-born professionals, it said. Construction, public transport, property and healthcare are sectors most likely to benefit from the government's initiatives and a rising population, brokerage DBS Vickers said in a report in mid-January on its expectations for the white paper. "The housing market was undersupplied in the past decade, due in part to policy oversight as well as a rapid influx of immigrants," it said. "Policy makers are playing a catch up game to increase housing supply over the next few years." Beyond raising stamp duties to make it more expensive for foreigners to buy property, the government is selling more land for development and accelerating construction of public housing. Other measures include higher spending on housing grants, subsidised childcare and cash gifts for newborns as part of an enhanced marriage and parenthood package called "Hey Baby". "Will Singapore sink? I think Singaporeans will adapt quickly," Lim Boh Keow, 51, who runs a dumpling stall in a food court. "There is no choice. We citizens don't get the chance to give our views. 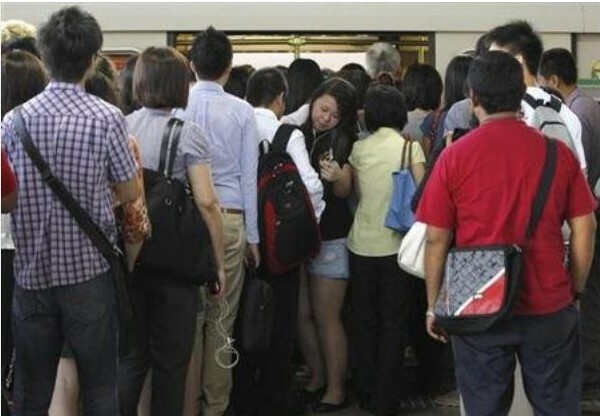 Even the first train every morning is packed."